Adjustable holder to attach 7″ to 9″ diagonal screen size tablets to tripods, monopods, selfie sticks with standard 1/4″- screw thread. Perfect for reading music, sharp image shooting, video recording, film watching, skype calls and much more. Adapter width: 4.8″ (12cm) – 7.8″ (19cm) with a secure lock. Also supports large phones (phablets) in portrait orientation. Phone’s width must be larger than 7cm. Made from high quality plastic and soft protective rubber for extra durability and protection. 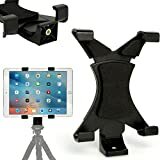 The iGadgitz tablet mount allows mounting your iPad to a Selfie Stick, Monopod, or any Tripod stand with standard 1/4″ threads. Soft foam padding protects your devices from shifting and scuffs. This entry was posted in Discount Photography and tagged Apple, Bracket, Holder, iGadgitz, inch, iPad, Mini, Mount, Screw, Tablet, Thread, tripods by Ball Photo. Bookmark the permalink.